Please join us on Saturday, January 9th or Sunday, January 10th for a presentation about the land grant program in ScienceSim. Details about participation in this program will be presented and information about applying for a parcel with be provided. If you cannot make these events, you may visit our regions in ScienceSim or in Second Life (Shengri La Hope) for more information, or send a request through your organizational email to admin at fashionresearchinstitute dot com. Please note we cannot respond to requests from noninstitutional addresses. Spirit was originally built for performance testing. Spirit is an authentic build of very high complexity; it was not synthetic data generated programmatically. Spirit provides an interesting data set to study because of the many prims of all sizes, some cut and convoluted and uniquely arranged; others feature sculpt maps, all arranged within a design that some regard as lovely, and others regard more as a compelling example of what the very early alpha code could be made to do. Spirit was built when the OpenSim code base was in the 4400-4600s when the challenges to building were substantial. Spirit redux is now running on r8737, which was created on 9th March 2009. According to Justin, prim loading is a ‘heck of a lot faster than it used to be’. It took 30 minutes on r4667 to load Spirit. Now it takes about 10 seconds. Logging back in to a build I had thought was gone forever was quite an experience. Every tiny prim crystal was present; the great metal horses in the fountain continued their mad charge into the sea. The flames in the candles still flickered, and drops of particle water rained from the central pillars in the meeting area. Justin and I are shown here, in Spirit version 1. We have physics turned off, so the entire build is phantom and we floated for our snapped moment. We’d like to thank Dave Levine, IBM Research for collaborating with FRI on Shengri La Spirit. 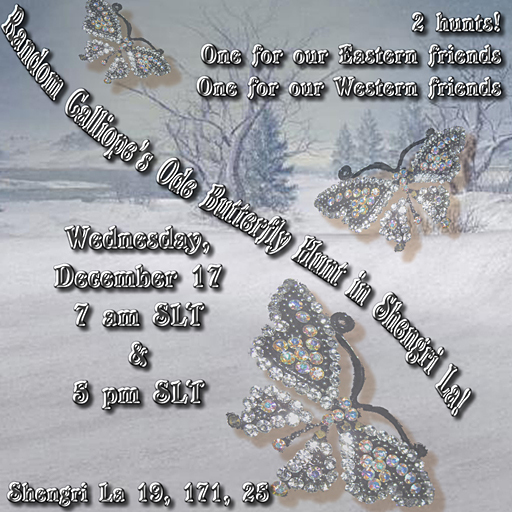 Courtesty of SL’s bumps and pains over the past weekend, the second Ode butterfly hunt has been rescheduled for this Wednesday, January 21, at 5 pm SLT. Join us on the lovely islands of Shengri La for the only five sim Ode butterfly hunt. With any luck, the grid will cooperate and we can all hunt butterflies! See you there! It’s time once again for our monthly Ode butterfly hunts in Shengri La. 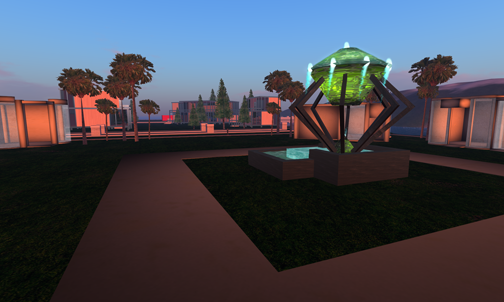 The first is scheduled at 7 am SLT and the second at 5 pm SLT. All five sims will be closed to the public for the hour prior to allow the butterfly handler to release her newest catch. POE hunters and all other visitors will be asked to leave the sims promptly at 6 am and at 4 pm. To hunt Ode-containing butterflies, just teleport to any of the sims, or start in the Shengri La Welcome Area. We have a full calendar of events in or related to our activities in Second Life. 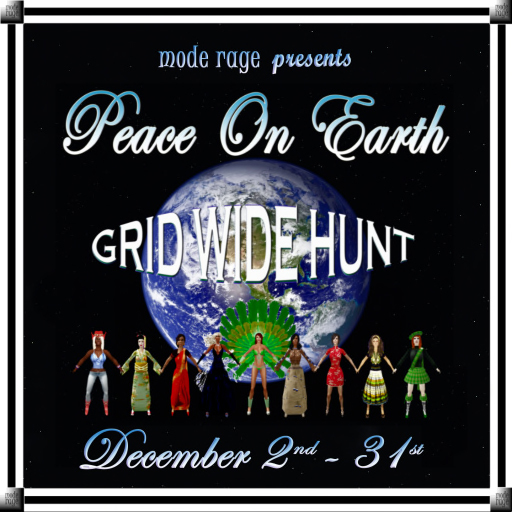 Kicking it all off, our Emerging Avatar Apparel Designers are participating in the Peace on Earth grid-wide treasure hunt, now through December 31st. Our designers have all created gifts especially for the hunt, and their work can be found by following the links included in the PoE globes. Please visit the Shengri La Welcome Area to pick up information about the hunt, to find the Fashion Research Institute’s globe, and to learn more about our activities in Second Life. Starting December 5th, we will host a special Candy Cane hunt benefiting CRY America. 100 candy canes, each stuffed with fashion, will be hidden on the Shengri La sims. Candy canes are priced at $25L, all proceeds to benefit CRY America. Some of the fashion items include gowns from the old Prim & Proper line, jewelry sets, boots, shoes, handbags and much more. 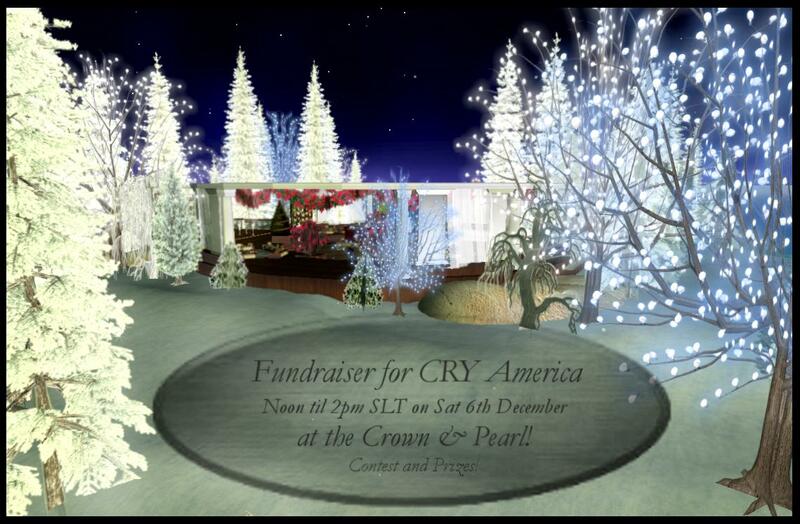 On Saturday, December 6th from noon to 2 pm slt, Ahuva Heliosense will be hosting a party benefiting CRY America. FRI is pleased to provide clothing and accessories in support of this activity and we hope that our colleagues and friends will all join us at the Crown and Pearl. 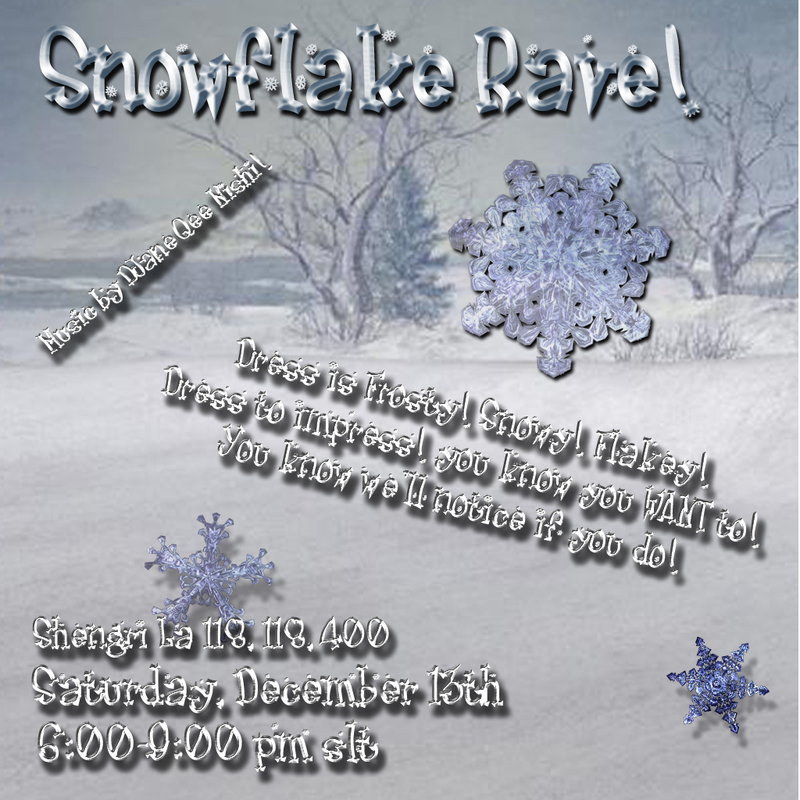 Saturday, December 13th from 6-pm slt, we will hold one of our raves, the Snowflake Rave, on Shengri La. DJane Qee Nishi will be DJing, dress will be your best interpretation of winter (or snow, or ice, you get to decide). December 17th, we will hold not one, but two Ode butterfly hunts. The Ode hunts are as ever, free to all, and are held from 7 am slt till the butterflies are gone; and from 5 pm slt till the butterflies are gone. Please note that we close the sims one hour prior to the hunts’ posted start times to allow the butterfly handler to release the butterflies. If you are present on the sims when we close them, you will be asked to leave the sims so she can perform her work in peace. Thank you for respecting this request. 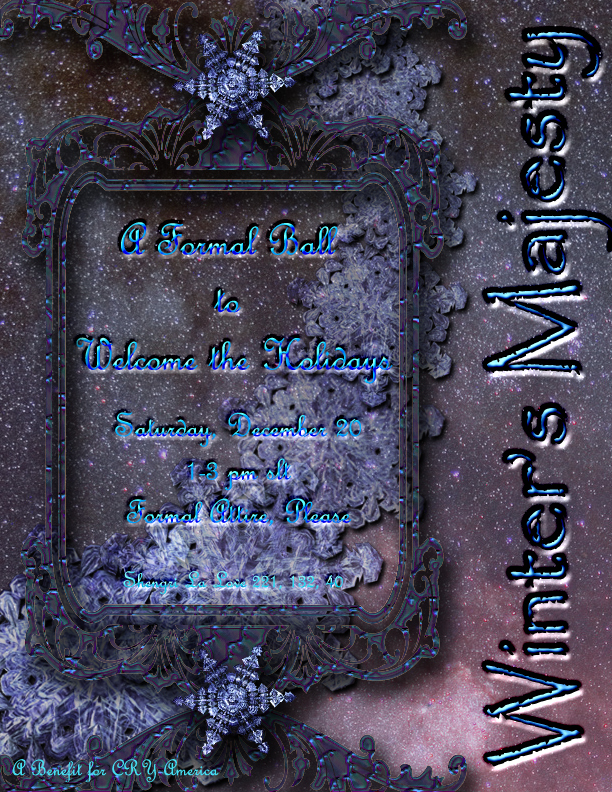 On Saturday, December 20th, we will hold a formal ball, Winter’s Majesty, with music provided by Benton Wunderlich. Chestnut Rau has graciously opened her dance floor in Shengri La Love for this event. Once again, this is a benefit on behalf of CRY America. Dress is majestically up to honor the holiday season, and we will have a special outfit for the ladies, designed especially for this event. Throughout the season, we invite you all to visit, skate on the several skating areas, ride our free horses, or drive our free carriages. We have both buckboards and pure white formal carriages with matching white horses, perfectly romantic and perfectly elegant. We will also have the holiday market in the Welcome Area of Shengri La. Please visit us to find all your holiday decorating needs fulfilled, and donate to CRY by purchasing any of the lovely items you will find under the trees.